Billions will be needed to rebuild Nepal after two deadly earthquakes in as many weeks. But what will happen to the money flowing into a country where corruption is seen as "endemic"? Britain is already the biggest national donor to Nepal - but what has happened to this aid? The village looks like it has been shelled, houses reduced to rubble. All that remains of one house are two faded blue wooden door frames - this was where a mother and her five-year-old son died. The remaining homes have walls sheared off and cracks big enough to put your fist into. The village is in Chhampi district, a 15-minute drive from Kathmandu. "Most of the buildings in this area are damaged, they are very vulnerable and need to be replaced," she said as, next to her, a family began levelling the ground to build a temporary shelter with whatever they could find. 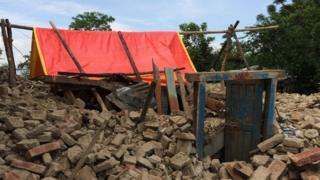 There are towns and villages like this across Nepal, with an estimated 800,000 houses, schools and government buildings collapsed or badly damaged. Millions have been spent by donors trying to prepare Nepal for just such a disaster. The UK's Department for International Development (DFID) has spent more than £20m ($30m) in the last four years on an earthquake resilience programme. So what has it achieved? One focus has been on improving building regulations and enforcing them. But walk through downtown Kathmandu and you see hundreds of new buildings that are unsafe, badly built and have clearly flouted these building laws. Kenichi Yokoyama, Nepal director of the Asian Development Bank, one of the biggest investors in the country, says it's common knowledge that building codes are ignored. "The enforcement is very poor, the approval of design documents [for buildings] can be bought," he explains. And DFID has defended its investment in the programme. A spokesman said the UK had been working with the government of Nepal to strengthen legislation but recognised it is "a long-term project". But a recent report by the International Development Committee, the parliamentary body which monitors DFID's performance, outlined its concerns with the country. Malcolm Bruce, who chaired the committee at the time, said that: "Nepal suffers from poor governance, and corruption is endemic. "If Nepal is to become less corrupt, improvements in governance and a change of culture have to be made to state institutions." DFID's resilience programme is part of a wide-ranging programme that includes the strengthening of a hundred school buildings to make them more resistant to earthquakes, the training of volunteers and the placing of shelter kits in locations throughout Nepal. Part of DFID's programme was carried out by the United Nations Development Programme, (UNDP) which received more than £5m in funding from the UK for its comprehensive disaster risk management programme (CDRMP). One senior aid insider told me the project was "a disaster from start to finish". Over five years, the UN spent £1.3m of its original £10m budget on two international employees. The UN said this was the original estimate but that only one person worked for the full five years so this figure was reduced to $750,000. Millions more went in what the public project document lists as unspecified "professional services". Subindra Bogati, who runs an NGO in Nepal and has worked as a consultant on previous big aid projects, said the budget "looks like a fifth-grader making it up. There hasn't been that much thought preparing the budget for this project." When DFID reported on the audit of the UN's disaster risk management programme in 2014 it delivered a damning verdict. It said the UNDP had "poor financial controls, weaknesses in payment processes and misreporting and recording of payments". DFID made a series of critical recommendations which it warned, if not corrected, could "affect the UNDP at a global level". The UN's resident co-ordinator in Nepal, Jamie McGoldrick, admitted there were problems but several other organisations had also failed audits at the time. "There's a great deal of scrutiny that comes with donor funding these days and there's a great deal of scrutiny on the scrutiny as well." But, he added, the disaster management project had been fixed. Because of the widespread corruption and bureaucracy within the government of Nepal, international donors like DFID have channelled their money into the big NGOs and UN agencies to deliver their programmes. Dr Govind Pokharel, vice-chairman of Nepal's National Planning Commission, admits the system is weak and corrupt but says the huge salaries on offer in NGOs and the UN means they are causing a brain drain in Nepal's civil service. "A government guy gets $200 for a month, whereas you are paying $2,000 per month at an NGO or agency, it is damaging," he says. These high salaries can provoke antagonism among the people donors are trying to reach. Subindra Bogati worked for three years on a £6m DFID-funded project to reform the police but it was cancelled before it got off the ground. The reason, he says, was the fees paid to consultants. "The Nepal police didn't like it. I was paid $300 (£190) a day but for the international consultants it was £1,200 a day." DFID said the project was cancelled because it wasn't deemed to be value for money. The huge rebuilding programme needed in Nepal will bring in more highly paid consultants. Jamie McGoldrick says that isn't always the best route. "There's a strong case to say we should use national consultants before we go international. There will be a wave that will come - whether it's a helpful wave remains to be seen." The Report: Aid to Nepal, is on BBC Radio 4 on Thursday 21 May at 20:00 BST. Listen online or download the programme podcast.